DATABASE CONNECTOR · 5-MINUTE READ · By Supermetrics on May 30 2017. You can now pull data from PostgreSQL and Amazon Redshift databases, and we have fixed the problems with connecting to SQL Server. PostgreSQL database can be either on-premises or in the cloud. When choosing the database type you will see supported cloud providers, such as Microsoft Azure SQL, in a separate list. We have made the access rules simpler for all database types: when you choose the Amazon routing option, all database requests come from from a single IP address (23.20.234.176), making it easy to configure firewall rules. You can now connect to databases more securely using an SSL (Secure Sockets Layer) connection. 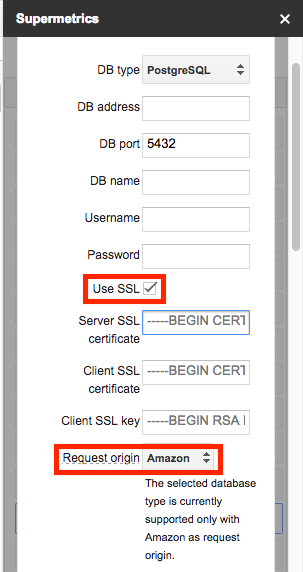 Choose Amazon routing option you only need a Server SSL certificate to get data; when connecting via Google, a Client SSL certificate and key are also required. Follow Supermetrics on Twitter to see the latest updates on our database connector’s functionality. If you don’t yet have Supermetrics for Google Sheets add-on, you can get it here.